This is a special dish, which my husband cooked for me on this Valentine's Day. Boil the chicken thighs in salty water, till they become soft. Then let them cool and place potatoes over a greased Pyrex or baking tray. Sprinkle 1 tsp salt and mix them. Preheat the oven to 400 F (200 C) and bake potatoes for 20-25 minutes till they are soft. Meanwhile in a small saucepan, sauté tomato paste with oil. And then stir in crushed tomatoes, remaining salt and water. Simmer for 2-3 minutes over low heat. Sprinkle the spices and turn the heat off. Take the potatoes from the oven and arrange the boiled chicken over them. Then pour the tomato sauce all over. Place them back to oven and bake for 15 minutes. 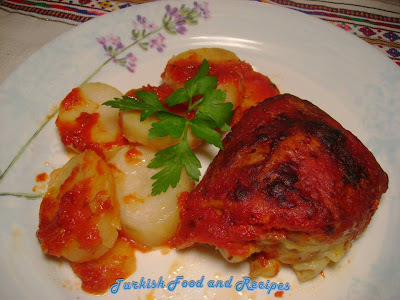 Serve Chicken with Tomato Sauce warm. Bu tarifi esim Sevgililer Gunu'nde benim icin yapti ve cok da guzel oldu. Tavuklari tuzlu suda haslayin. Sonra patatesleri yaglanmis borcam/firin tepsisine aktarin ve 1 tatli kasigi tuz serpip harmanlayin. Onceden isitilmis 200 C (400 F) firinda patatesler yumusyana dek yaklasik 20-25 dakika pisirin. Bu sirada bir tencerede sivi yag ile domates salcasini kavurun. Sonra domatesi geri kalan tuzu ve suyu ilave ederek, kisik ateste 2-3 dakika pisirin. Baharatlari ilave edin ve atesten alin. Firindan cikardiginiz patateslerin uzerine haslanmis tavuklari yerlestirin ve uzerine hazirladiginiz domates sosunu dokun. Tekrar firina koyarak 15 dakika kadar pisirin.